Will you update us on your new cookstove? Nothing to update. It's still not installed. That's one of our fall projects. I understand canning home produce (Delicious! Frugal! ), but I am a little bewildered as to why you would buy produce to can. Wouldn't it be easier and more cost effective just to buy canned mushrooms? First, because we can't (or don't) grow our own mushrooms. Second, home-canning purchased produce is usually cheaper than buying the same thing pre-canned. And third, I know what's in my little jars of mushrooms. The last time I looked, tiny cans of mushrooms in our grocery store all came from China. Color me funny, but I don't want to eat anything canned in China. I am amazed at the amount of effort that you put out every day! I wish I had your energy. I agree with you that I do not want to buy anything canned or processed in China I am continually thwarted by Wal Mart where it says on the can distributed by wal mart in Arkansas. I try to pass on as much of those as possible but here in the wilds of NE Texas that is the only low cost provider. The other main grocery store we have in the town 15 miles away is up to $1 higher on most everything. You and I were on the same wavelength. I, too, canned mushrooms. I put some into quarter pints for when the recipe calls for smaller amounts as I personally do not care for mushrooms that much but my husband loves them. I did button and portobellos. My hat is off to you for doing so much. I only did 5 pounds worth. Happy canning. I LOVE that you have a messy kitchen, and you actually USE your kitchen. I have seen beautiful, spotless kitchens that NEVER get used.You go girl!!! 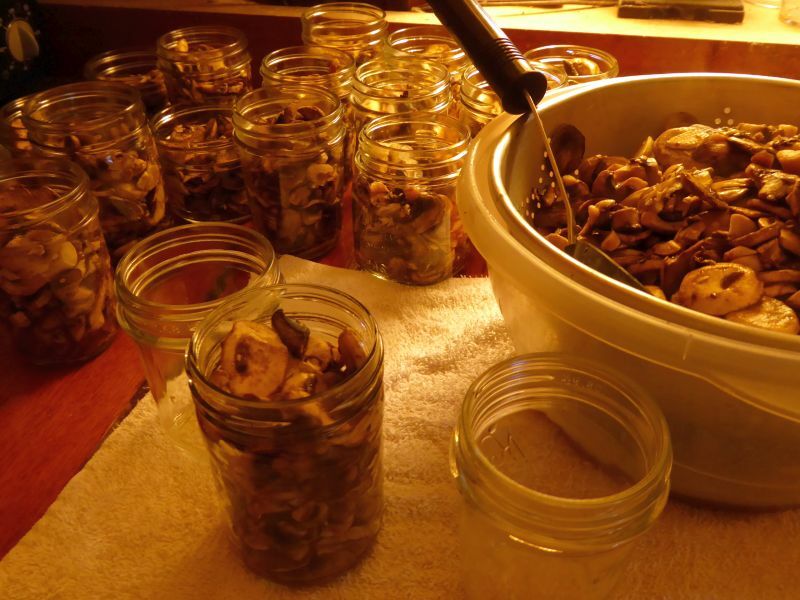 I have also dehydrated sliced mushrooms and then vacuum sealed them in pint jars. I keep one jar in the cupboard so whenever I'm scrambling eggs or putting a soup/stew together in the crock pot it's easy to grab a handful and crumble to the desired size. It's a great "homemade" convenience food. Holy smokes. Fifty? Yow. That's a lot! I love the canning posts. Though I'm no match for the canning Goddesses here on this blog, I'm proud of my recent canning successes, all boiling water bathed since I'm still too scared of a pressure canner. I'm so grateful for this blog giving me the confidence to practice my canning. I'm learning to feel more comfortable with it and I'm getting to know the rhythm. I've made some delicious food lately! I often add a good healthy splash of red wine to the 1/2 pt when canning mushrooms…OH YUM!!!!!! I had a love/hate relationship with the Tattler lids until I read a piece of advice from Tattler: with one hand (don't grip the jar with the other hand), screw the ring on until the jar just starts to spin. That has almost eliminated my problem with sealing. Well that and one other thing which is cheap jars. Actually, cheap rings. We needed some more jars and couldn't find Ball brand anywhere so we ended up buying some from Walmart. The rims are thinner but that doesn't seem to be the problem. The rings won't properly catch the threads with the thicker Tattler lids unless you screw them down too far. Since then, whenever I find a ring that won't properly catch, I've been throwing them out. Also, I'm only buying the Ball jars in the future unless I can get some second hand! Excellent post. I've dehydrated mushrooms, but never thought of canning them. I'm going to have to try this! Just wondering, what the cost per 1/2 pt figured out to be? After the deer got into not only our garden, but the only 'pick to buy' garden within miles, we finally got almost 21 qts of sweet or candied dill pickles. The deer demolished tomatoes, beets, okra, peppers, watermelon, etc; I doubt we do much fresh from the garden canning the rest of this summer. I could see the deer coming in if we had had a dry summer, but this has been the wettest in over 5 years, and nowhere has the grass even thought of turning brown. The creeks are up, the ponds are full, it's just been pitiful. On to canning bacon bits, beans of every description, and meals in a jar. One way or another, I'm getting something put in the larder for this winter. Please consider addressing how Tattler lids work. I like the idea but find the process confusing. I always end up buying regular canning lids because I know how they will act and seal. Thanks!